We have a choir or group to fit almost any musical taste, all of which are focused on preparing God’s people for worship and praise. 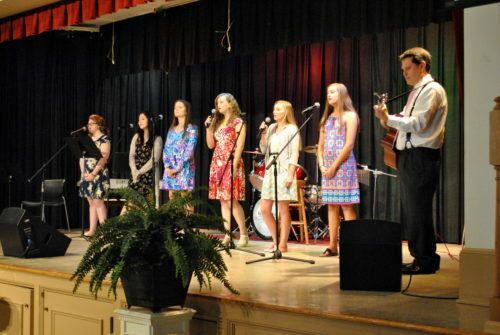 For more about the musical opportunities at First Baptist, email Tim Little, Minister of Music. 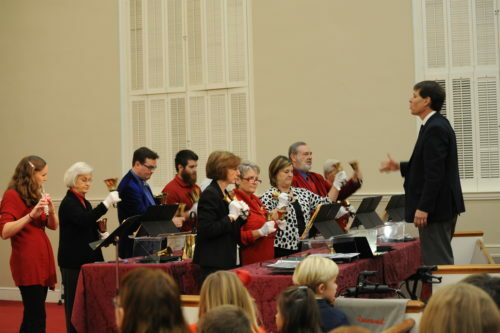 The Adult Handbell Choir rehearses every Sunday night at 6:00 from September to May. This is an advanced group which rings medium to advanced music which they share in worship several times during the year. Our Early Worship Ensemble leads in our 8:45 worship service. This group leads our congregation in singing praise choruses, prepares musical selections that people are hearing on Christian Radio stations for use in worship, and performs at various community events. Our Music Munchkins meet each Wednesday during prayer service during the school year. This group is made up of children ages 3 – 5. Children learn basic musical concepts while learning songs about Jesus. This group sings in a program with the other graded choirs at Christmas and at the end of the school year. They also sing in the 11:00 worship service several times during the year. Our Music Makers choir is for children grades 1 – 3. In the Music Makers choir, children sing songs of our faith while learning basic music theory concepts. They get to use instruments as well as sing and learn how to read music and rhythms together. This choir sings in the 11:00 worship service several times during the year. They also participate in the Christmas and Spring concerts. 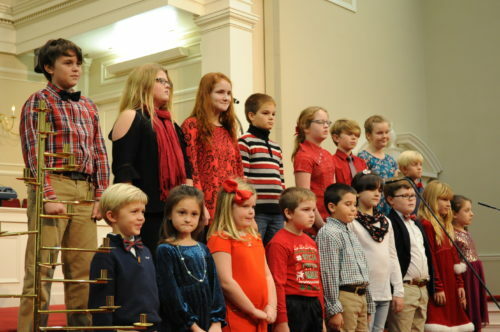 Our Young Musicians choir is for children grades 4 – 6. This group moves on to more advanced musical concepts and more challenging music. They sing in worship more frequently than the younger groups and are more oriented towards performance than the other two children’s choirs. Children in grades 1-6 are also invited to participate in our Summer Music Day Camp. This is a 5 day in-house camp with music, Bible study, field trips, and more. The week concludes with a presentation of the music they have learned. Our Young Musicians Bells are our youngest ringing group. They generally ring 3 octaves and ring easy to medium music. In this group, children learn to read music, how to work as an ensemble and the basics of handbell techniques. This group plays in the 11:00 worship service several times each year and participates in the children’s Christmas and year-end concerts. Our Youth Choir prepares a variety of music for use in worship and go on a retreat in the summer. They also lead in worship on Youth Sunday and other times during the year. Our Youth Bells have a variety of ringing opportunities. The large group rings 5 octaves and uses 13 people. Youth Choir and Youth Bells rehearse on Sunday afternoons at 4:45 and alternate rehearsal months. For information about the current rehearsal schedule, contact Tim Little or Doug Reedy.